Be The First to Review the RC-Moon Pie 10 Mile Run! The RC-Moon Pie 10 Mile Run is a Running race in Bell Buckle, Tennessee consisting of a 10 Miles. A beautiful countryside certified course with the charm of a small town and the excitement of a big race! The Bell Buckle RC-MoonPie 10 Mile Run is a perennial runner favorite for 22 years! At the pictureque finish line, each runner will enjoy a full breakfast including fruit, biscuits, breakfast meats, and of course RC's and MoonPies! Race shirts for pre-regsitered runners and trophies in age divsions as listed on webiste. Showers available after the race along with a fun full day of festivities with the Bell Buckle RC-MoonPie Festival including a parade, a coronation, games, music, and serving of the the World's Largest MoonPie. 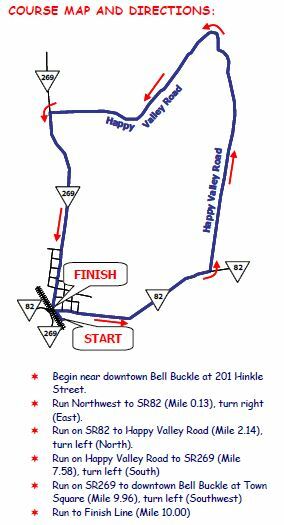 bellbucklechamber.com	View Course Map	Incorrect Race Info/Update Race Details?